Durham police respond to officer-involved shooting at Tower Blvd. McDonald's early Wednesday morning. DURHAM, NC -- Durham police are investigating an early morning officer-involved shooting at a McDonald's restaurant. It began with a 911 call just before 4 a.m. about a robbery at the restaurant at 3117 Tower Boulevard. When officers arrived, all the lights in the restaurant were off, but police said they noticed movement inside. As officers went inside the business, they saw a man with his arm around a female employee's neck. The suspect repeatedly threatened to kill the employee, according to a preliminary investigation. 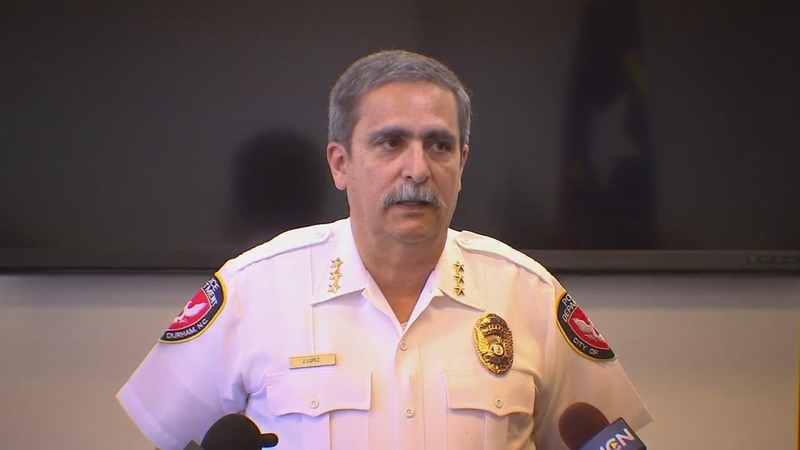 It is unclear if the suspect was armed, but Durham Police Chief Jose Lopez said in a news conference Wednesday morning that the suspect was capable of hurting the woman. Click to watch the entire news conference. Authorities said after a brief standoff, an officer fired one shot, striking the suspect in the face. Authorities said after a brief standoff, an officer fired one shot, striking the suspect in the face. The suspect, who was conscious and talking, was taken to the hospital for treatment of serious injuries. The employee, along with two others inside the restaurant, were not injured. Their names have not been released, but Lopez did say the suspect has a criminal history. The officer, whose name is also not being released at this time, has been placed on administrative leave with pay, which is standard procedure in an officer-involved shooting. The investigation is still on-going, and Lopez said it was unclear how the suspect got into the restaurant. The incident is being investigated by the N.C. State Bureau of Investigation. The Durham Police Department's Professional Standards Division and Criminal Investigations Division is also investigating the incident, which is also standard procedure in any officer-involved shooting. The McDonald's, which is expected to reopen at 6 p.m., has been robbed three times since 2008.